2. Cook the ground turkey. I used some salt and other spices to give it flavor. 3. 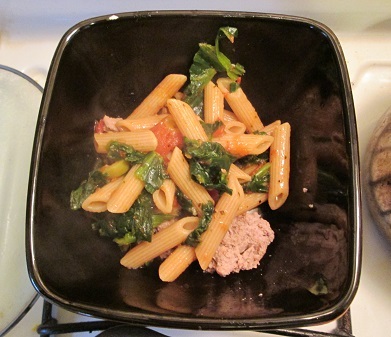 Once the noodles are almost done cooking, take some frozen spinach and put it in the pot to cook. 4. Once all the main ingredients are cooked, get the Central Market spaghetti sauce and pour a serving into the pot with the noodles, after the water is drained. The sauce will then be nice and warm.